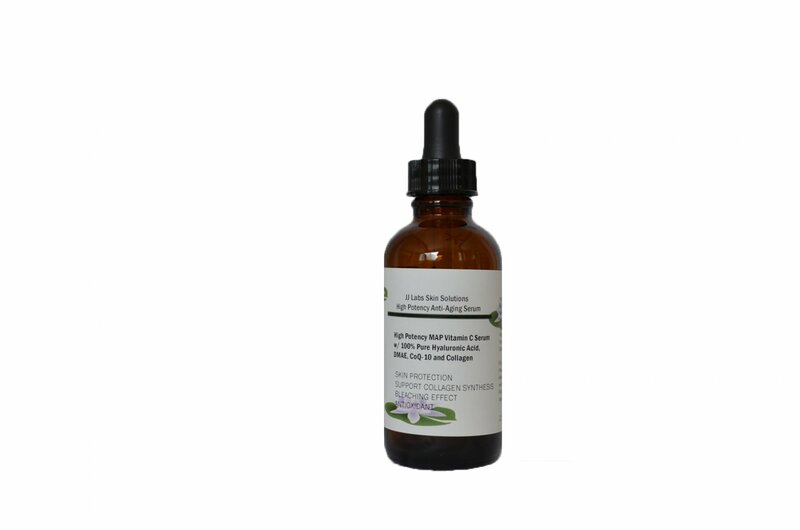 We are very proud of our newest high quality 15% MAP(Magnesium ascorbyl phosphate) Vitamin C Serum because of its exceptional results and competitive price compared to other products on the market. Our quality is in a class of its own especially because we don't have any useless fillers or harmful chemicals! Other companies won't put a proper amount of the advertised ingredients for it to work properly, which forces you to buy more for barely noticeable results! The quality of our HIgh Potency 15% Map(Magnesium ascorbyl phosphate) Vitamin C with Pure Hyaluronic Acid, DMAE, Coenzyme Q(Co-Q-10), Vitamin E and Collagen speaks for itself! We are so sure that you are going to LOVE our product that we offer a money-back guarantee! Satisfaction guaranteed or your money back! Contact us for more information! We try to answer all questions within 12 hours to provide you with the best customer service! Get younger LOOKING and FEELING skin in less time than it takes for you to get ready in the morning! JJ Labs' highly concentrated formulas ensure that you will see noticeable results in as little as 5 minutes! All of our ingredients are completely natural and extremely beneficial for your skin! Try it now and join the hundreds of users that have benefitted from our products! Satisfaction guaranteed or your money back! Contact us for more information. We make all of our products right after they are placed so as to provide you with the FRESHEST and best quality serums! High Potency 15% MAP(Magnesium ascorbyl phophate) Vitamin C w/Pure Hyaluronic Acid,DMAE,CoQ-10 Vitamin E and Collagen 2.3 oz. JJ Labs Skin Solutions 15% MAP Vitamin C Serum is one of the most potent MAP products on the market today! It is guaranteed effective and non-irritating. It is professionally formulated for UV protection and repair, boosting collagen production, skin lightening and brightening, and anti-inflammatory. Magnesium Ascorbyl Phosphate (MAP) is a water-soluble, non-irritating, stable derivative of Vitamin C. It has the same potential as Vitamin C to boost skin collagen synthesis but is effective in significantly lower concentrations, and can be used at concentrations as low as 10% to suppress melanin formation (in skin-whitening solutions). It is more stable than L-ascorbic acid and is as effective as vitamin C to boost skin collagen synthesis but is effective in significantly lower concentrations. Because of those reasons, MAP has rapidly gain popularity in skin care. When comparing MAP with vitamin C, it is important to note that MAP may be more suitable for people with sensitive skin and those wishing to avoid any exfoliating effects, as some Vitamin C formulas are highly acidic (and therefore produce exfoliating effects). In skin care products, MAP is also used for UV protection and repair, collagen production, skin lightening and brightening, and as an anti-inflammatory. It is also a potent antioxidant. It is considered an excellent non-irritating skin whitening agent that inhibits skin cells to produce melanin and lightens age spots, and is a great alternative to Quinone. MAP is a also a potent anti-oxidant that can protect skin from oxidation and UV rays, and is used as an anti-inflammatory. Safety Measures/Side Effects: There are no adverse side effects to MAP, although those with sensitive skin may need to be aware of Vitamin C's acidic and exfoliating effects. However, Magnesium Ascorbyl Phosphate (MAP) is generally considered more gentle than traditional Vitamin C and more preferable for sensitive skin. Paraben free, no color, no fragrance, and no alcohol. 100% pure Magnesium Ascorbyl Phosphate as the vitamin C source, non-irritating. Higher concentration of MAP than most other MAP products. Enhanced with other natural and powerful ingredients for skin hydration and anti-oxidant, such as hyaluronic acid, Vitamin E, and more! Quick absorption by skin, not oily. How does Vitamin E enhance the potency of vitamin C? Vitamin E is a fat soluble antioxidant that can seek and destroy several different types of free radical. Research has found that the combination of vitamins C and E appears to increase protection from UV-induced skin damage. Vitamin E is one of the most powerful antioxidants that protects your cells from free radicals that cause pre-mature aging and acne. Hyaluronic acid, also known as HA, is a natural compound found in skin that has many important functions, including holding in moisture, providing cushioning, aiding in tissue repair, holding together the skin structural components collagen and elastin, and helping create a protective barrier against microorganis. DMAE promotes healthy skin by preventing a substance that can lead to wrinkles and aging of the skin. Coenzyme Q10 is a mineral which has a huge role in the production of skin cells and is a crucial component in the cellular energy production cycle. It is a antioxidant that has great importance as a free radical scavenger. CoQ10 protects the stability of the cell membrane, protects DNA from free radical induced oxidative damage, and helps recycle Vitamin E.
As a potent antioxidant, vitamin C also appears to prevent sun damage, even after sun exposure. Because vitamin C helps break the chain of destruction caused by the sun-induced free radicals, this vitamin helps to halt, or slow, skin damage. In addition, because vitamin C is absorbed into your skin, neither water activities nor perspiration can wash it off. When vitamin C is properly delivered into skin cells, there is a good chance to reduce wrinkles and improve skin texture. Studies have proven that Vitamin C helps to minimize fine lines, scars, and wrinkles. It is also a natural skin brightener and lightener and will reduce uneven pigment (sun spots, age spots, liver spots, melasma) by inhibiting melanin production. Collagen acts like a cushion for the skin, helping it look strong, healthy, and silky. It improves the skin’s elasticity, which provides finesse, beauty, and freshness. Instructions: Apply a small amount of serum throughout face. Gently massage face with upward motions until serum has completely been absorbed by skin. Use twice daily, morning and night.